This stunning memoir is a tribute to a family that was unwittingly torn apart by circumstances beyond their control when an American Airlines flight crashed into their building on January 22, 1952. It was heartbreaking, shocking, and at times, even warmed my heart. 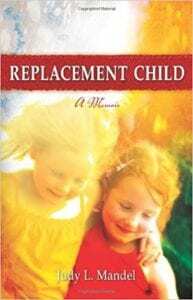 I wanted to read this book because a friend once said to me, “How would you feel if you were the replacement child?” Judy Mandel says in no uncertain terms what it is truly like to be one and made me understand what can happen when parents agree with the Dr. Horowitzs of the world. I was simply mesmerized with this story and how well it was written. People may object to the title as it will strike a cord with many, but when I read lines such as “the only cry in her short life I was unable to answer,” in reference to Donna’s struggles, this struck a cord with me. Quill says: This was one amazing memoir!